See what we've got on sale at the moment. Or call us now for our best prices. Narrow down our tyre specials by vehicle or tyre size. Finding the best deals for you... please wait one moment. 1. The Promoter of this Promotion is Yokohama Tyre Australia Pty Ltd, ABN 26 001 361 459, 123 – 129 Silverwater Road, Silverwater NSW 2128. 2. The Promotion is open to residents of Australia, aged 18 years and over. Only one entry per household is permitted. Information on how to enter and receive cash back forms part of these Terms and Conditions. 3. The Promotion commences Monday 1 April - Tuesday 30 April 2019 (“Promotion Period”). 4. To be eligible to receive the cash back, you must visit a participating tyre dealer and purchase 4 (four) selected Yokohama tyres during the Promotion Period. PC tyres 16” and below receive a $50 cash back. PC tyres 17” and above receive a $100 cash back. Selected 4WD/SUV tyres receive a $100 cash back. 5. This offer applies only to the purchase of tyres described in Clause 4 above in one retail transaction during the Promotion Period. This offer is available strictly while stocks last. 6. This offer cannot be claimed in conjunction with any other offer or promotion. 7. Participating tyre dealers include Tyreright, Bob Jane T-Marts and Yokohama Preferred Dealers. 9. All redemptions must be lodged online by May 31st 2019 in order to be eligible to receive cash back offer. 10. Government, wholesaler and fleet customers of Yokohama Tyre Australia are ineligible for the “$50 Cash Back Offer” and the “$100 Cash Back Offer”. 11. Entrants must keep a proof of purchase which identifies the date of purchase, the 4 (four) Yokohama tyres purchased and the tyre dealer from where the 4 (four) Yokohama tyres were purchased (credit card receipts will not be accepted) and provide it to the Promoter upon request. Promoter accepts no responsibility for applications/receipts lost, delayed or damaged in the post. Proof of posting is not proof of delivery. 12. The prize (the cash back) cannot be transferred or exchanged for other goods and services. 13. By claiming the purchase, entrants are deemed to accept these Terms and Conditions. 1. By taking part in this “up to $100 Cash Back Offer” participants agree to be bound by these terms and conditions. 2. The promotion commences on 1st April 2019 and closes on 30th April 2019 (“Promotion Period”) and entry is open to Australian residents only. 4. Bridgestone Dueler & Bridgestone Alenza tyres are suitable for certain vehicles only. Seek advice from your local store or by using the tyre search function here. 5. The offer applies only to the purchase of tyres described in Clause 3 above, in one retail transaction and on one invoice during the Promotion Period and strictly while stocks last. Not all sizes available at all locations. 6. This “up to $100 Cash Back Offer” is not available on any other tyres manufactured or distributed by Bridgestone. 7. Available at participating Bridgestone Select, Bridgestone Service Centre and Bridgestone Tyre Centre stores only. 8. Subsidiary companies, retailers and agencies of Bridgestone Australia Ltd., are ineligible for the “up to $100 Cash Back Offer”. 9. Government, wholesale and fleet customers of Bridgestone Australia Ltd. are ineligible for the “up to $100 Cash Back Offer”. 10. Eligible customers will receive the discount off invoice in store at the time of purchase. 11. This promotion cannot be combined with any other offer including, but not limited to motoring club discounts, VIP card programs and all other promotions. 12. The promoter’s decision on all matters relating to this “up to $100 Cash Back Offer” is final, and no correspondence will be entered into. 14. The promoter is Bridgestone Australia Ltd. 196 Greenhill Road, Eastwood, SA 5063. ABN 65 007 516 841. 1. By taking part in this “Get the 4th Tyre FREE” offer participants agree to be bound by these terms and conditions. 2. The promotion commences 1st April 2019 and closes on 30th April 2019 (“Promotion Period”) and entry is open to Australian residents only. 3. To be eligible to receive the 4th tyre free, you must visit a participating store and purchase a set of 4 or multiple of 4 Bridgestone Ecopia car or SUV tyres in one transaction per vehicle. 4. Bridgestone Ecopia tyres are suitable for certain car & SUV vehicles only. Seek advice from your local store or by using the tyre search function here. Where staggered fitments are required, the free tyre will be offered on the tyre with the lowest price. 5. The offer applies only to the purchase of tyres described in Clause 3 above, in one retail transaction during the Promotion Period. Offer available strictly while stocks last. Not all sizes available at all locations. 8. 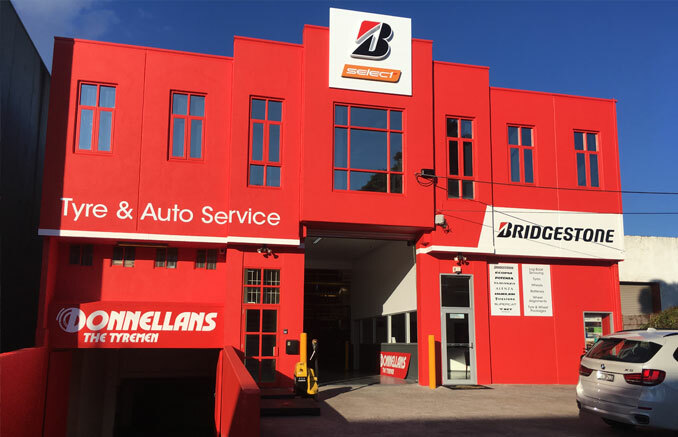 Subsidiary companies, retailers and agencies of Bridgestone Australia Ltd., are ineligible for “Get the 4th Tyre FREE” offer. 9. 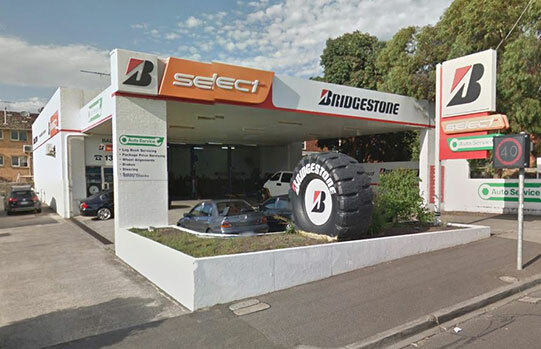 Wholesale customers of Bridgestone Australia Ltd. are ineligible for the “Get the 4th Tyre FREE” offer. 10. Eligible customers will receive the 4th tyre free off the invoice at the time of purchase. 12. The promoter’s decision on all matters relating to this “Get the 4th Tyre FREE” offer is final, and no correspondence will be entered into. CHOOSE PIRELLI & GET A $300 GIFT! Buy 4 Pirelli Tyres of > 17” rim in the CINTURATOTM or SCORPIONTM range and select your favourite Gift from the Pirelli Gift Store! at www.jaxtyres.com.au if you have purchased a set of Pirelli Cinturato or Scorpion tyres at a Jax store. If instead you have purchased a set of Pirelli Cinturato or Scorpion tyres from one of the selected Independent store participating in the promotion, please continue with the registration on this page. Promotion available only at participating Bob Jane T-Marts, JAX Tyres and selected Independent stores. 1. Information on how to enter form part of these Terms and Conditions. Participation in this Promotion is deemed acceptance of these Terms and Conditions. 2. Promotion commences at 7.30am AEDST in Participating Dealers 1 November 2018 and ends at close of business in Participating Dealers on 28 February 2019. 3. Purchase a set of four (4) or more MICHELIN passenger car tyres with a diameter of 16 inches and below or a set of four (4) MICHELIN light truck tyres to receive $50 gift card via redemption. Purchase a set of four (4) or more MICHELIN passenger car tyres with a diameter of 17 inch and above or a set of four (4) MICHELIN recreational tyres to receive $100 gift card via redemption. There is a strict limit of one (1) gift card promotion per Qualifying Transaction (as defined below), regardless of whether the number of tyres purchased in that transaction is in excess of four (4) MICHELIN passenger car, recreational or light truck tyres. 4. Qualifying products eligible for the $50 gift card promotion are MICHELIN passenger car tyres with a diameter of 16 inch and below and MICHELIN light truck tyres. Qualifying products eligible for the $100 gift card promotion are MICHELIN passenger car tyres with a diameter of 17 inch and above and MICHELIN recreational tyres. 5. Participating Dealers: If the Qualifying Purchase is made at any Participating Dealer store, the Eligible Individual must immediately after completion of a Qualifying Transaction follow the instructions on the entry flyer given by the staff at the checkout (together with their purchase receipt). The Eligible Individual will need to visit www.promo.michelin.com.au to claim their gift card, follow the prompts to the Promotion entry page, input the requested details (including their full name, telephone number and a valid email address), attach a scanned copy of their original purchase receipt/invoice for the Qualifying Transaction and submit the fully completed entry form no later than 11.59pm AEDST on 31 March 2019. 6. In order to qualify for this Promotion, individuals must purchase, in a single transaction, a set of four (4) or more MICHELIN passenger car, SUV or light truck tyres in Australia between 7.30am AEDST on 1 November 2018 and close of business on 28 February 2019 ("Qualifying Transaction") at a Participating Dealer. "Participating Dealers" will be any store in Australia that display advertising material for this Promotion during the promotional period and are listed at www.promo.michelin.com.au. 7. Fleet, trade and wholesale purchases are excluded and will not qualify for entry in this promotion. 8. There is a strict limit of one (1) redemption per Qualifying Transaction/invoice, regardless of whether the number of eligible tyres purchased in that transaction is in excess of four (4) MICHELIN passenger, recreational or light truck tyres. 9. For individuals who complete a Qualifying Transaction at a Participating Dealer, the eftpos card will be sent to the mailing address nominated by the entrant on the entry form on www.promo.michelin.com.au. 10. Once an entrant receives their eftpos card, he/she must activate it by following the instructions on the eftpos card by the indicated date. Each gift eftpos card can only be activated once. Once the gift eftpos card is activated, the eftpos card can be used at any location where eftpos is accepted (with the funds on the card becoming active the next business day for a period of twelve (12) months. The date of issue for the eftpos cards received via post will be the date the respective eftpos card is posted, which will appear on the issuing letter. 11. Information and terms set out here (including instructions on how to enter) form part of these Terms and Conditions. Participation in this Promotion is deemed acceptance of these Terms and Conditions. 13. In the event of war, terrorism, state of emergency or disaster, the Promoter reserves the right to cancel, terminate, modify or suspend the Promotion or suspend or modify the cash back promotion, subject to any written directions from a relevant regulatory authority. 14. If this Promotion is interfered with in any way or is not capable of being conducted as reasonably anticipated due to any reason beyond the reasonable control of the Promoter, including but not limited to technical difficulties, unauthorised intervention or fraud, the Promoter reserves the right, in its sole discretion, to the fullest extent permitted by law: (a) to disqualify any entrant; or (b) subject to any written directions from a regulatory authority where required, to modify, suspend, terminate or cancel the Promotion, as appropriate. 15. Nothing in these Terms and Conditions limits, excludes or modifies or purports to limit, exclude or modify the statutory consumer guarantees as provided under the Competition and Consumer Act, as well as any other implied warranties under the ASIC Act or similar consumer protection laws in the States and Territories of Australia ("Non-Excludable Guarantees"). 16. Except for any liability that cannot by law be excluded, including the Non-Excludable Guarantees, the Promoter and Participating Dealers (including their respective officers, employees and agents) are not responsible for and exclude all liability (including negligence), for any personal injury; or any loss or damage (including loss of opportunity); whether direct, indirect, special or consequential, arising in any way out of: (a) any technical difficulties or equipment malfunction (whether or not under the Promoter's control); (b) any theft, unauthorised access or third party interference; (c) any entry that is late, lost, altered, damaged or misdirected (whether or not after their receipt by the Promoter) due to any reason beyond the reasonable control of the Promoter; (d) any variation in value to that stated in these Terms and Conditions; (e) any tax liability incurred by an entrant or (f) the Promotion. 17. This offer cannot be used in conjunction with any other offer, unless stated otherwise by the Promoter. 19. The Promoter is Michelin Australia Pty Ltd (ABN 84 006 761 628) of 51-57 Fennell Street, Port Melbourne, VIC 3207, telephone (03) 8671 1000. 2. The promotion commences 1st March 2019 and closes on 31st March 2019 (“Promotion Period”) and entry is open to Australian residents only. 3. 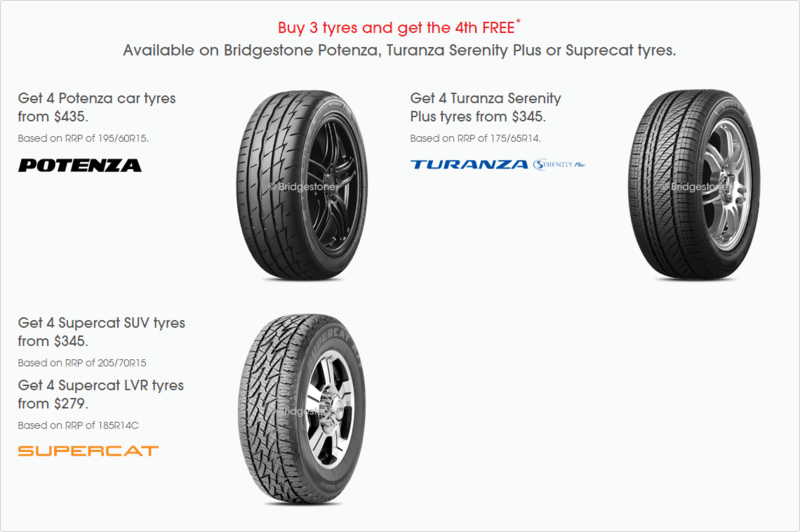 To be eligible to receive the 4th tyre free, you must visit a participating store and purchase a set of 4 or multiple of 4 Bridgestone Turanza Serenity Plus car tyres or 4 Bridgestone Potenza car tyres or 4 Supercat SUV and light van tyres in one transaction per vehicle. 4. Bridgestone Turanza Serenity Plus tyres are suitable for certain car vehicles only. Bridgestone Potenza tyres are suitable for certain car vehicles only. Supercat tyres are suitable for certain SUV and light van vehicles only. Seek advice from your local store or by using the tyre search function here. Where staggered fitments are required, the free tyre will be offered on the tyre with the lowest price. 5.The offer applies only to the purchase of tyres described in Clause 3 above, in one retail transaction during the Promotion Period and excludes Motorsport tyres. Offer available strictly while stocks last. Not all sizes available at all locations. 6.This “Get the 4th Tyre FREE” offer is not available on any other tyres manufactured or distributed by Bridgestone. 7.Available at participating Bridgestone Select, Bridgestone Service Centre and Bridgestone Tyre Centre stores only. 8.Subsidiary companies, retailers and agencies of Bridgestone Australia Ltd., are ineligible for “Get the 4th Tyre FREE” offer. 10.Eligible customers will receive the 4th tyre free off the invoice at the time of purchase. 11.This promotion cannot be combined with any other offer including, but not limited to motoring club discounts, VIP card programs and all other promotions. 12.The promoter’s decision on all matters relating to this “Get the 4th Tyre FREE” offer is final, and no correspondence will be entered into. 1. By taking part in this “Cash Back Offer” participants agree to be bound by these terms and conditions. 3. To be eligible to receive $80 Cash Back, you must visit a participating store and purchase a set of 4 or multiple of 4 Supercat car tyres in one transaction per vehicle. To be eligible to receive $40 Cash Back, you must visit a participating store and purchase a set of 2 or multiple of 2 Supercat car tyres in one transaction per vehicle. 4. Supercat car tyres are suitable for certain vehicles only. Seek advice from your local store or by using the tyre search function here. 6. This “Cash Back Offer” is not available on any other tyres manufactured or distributed by Bridgestone. 8. Subsidiary companies, retailers and agencies of Bridgestone Australia Ltd., are ineligible for the “Cash Back Offer”. 9. Wholesale customers of Bridgestone Australia Ltd. are ineligible for the “Cash Back Offer”. 10.Eligible customers will receive the discount off invoice in store at the time of purchase. 12. The promoter’s decision on all matters relating to this “Cash Back Offer” is final, and no correspondence will be entered into. Offer available via redemption at www.promo.bfgoodrich.com.au. 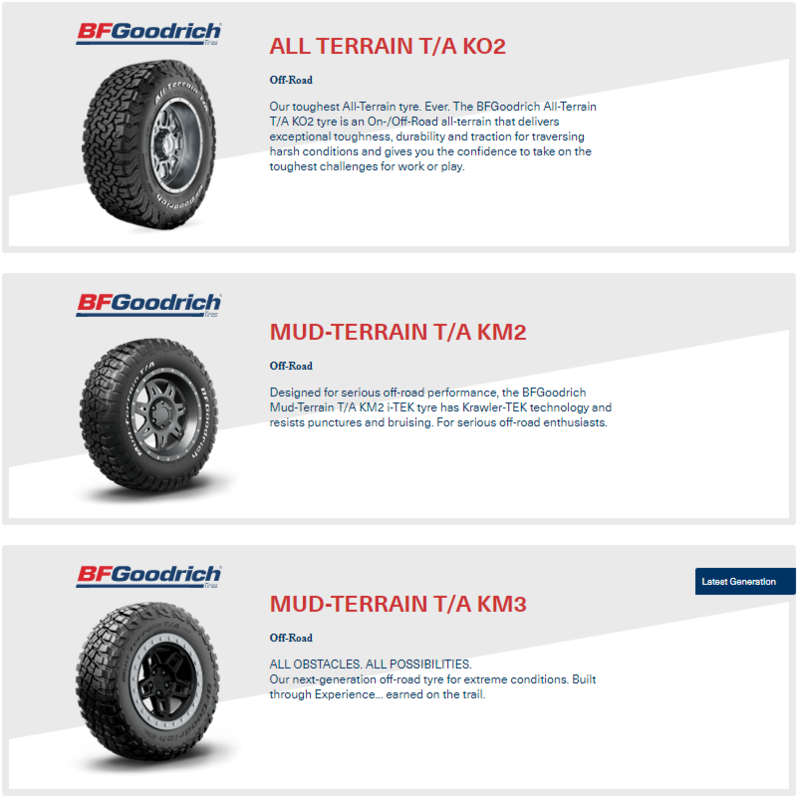 BFGoodrich Mud Terrain T/A KM2 tyres or BFGoodrich Mud Terrain T/A KM3 tyres in one transaction.